In the almost 25 years since the creation of the first website a lot of technical changes have occurred and we have evolved from one site to over a billion sites. Obviously there is a lot of information available on the web, and weeding out the accurate from the inaccurate can sometimes be overwhelming. 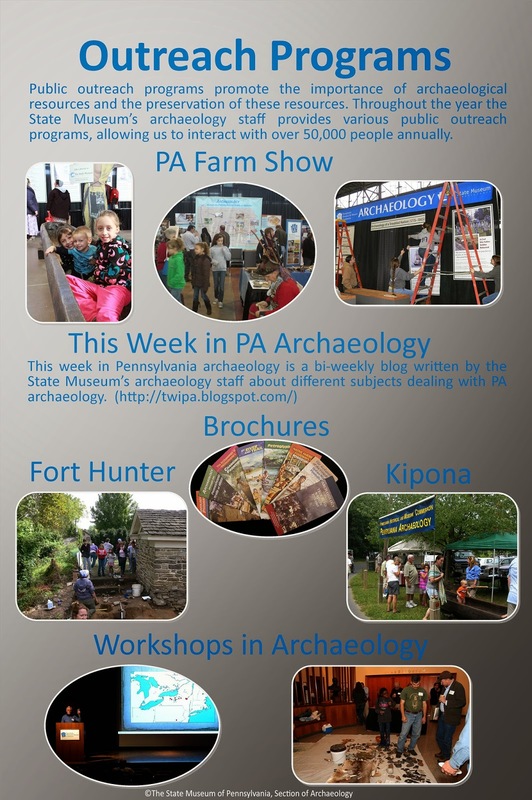 Today, we’d like to direct you to the web site for the Pennsylvania Historical & Museum Commission and more specifically to the Archaeology Page. Recently, the State Museum’s Section of Archaeology has been actively improving its website. Our goal to share resources through our current site has proven difficult. In the next few months significant structural changes will be made, and, if all goes well, a more navigable and useful website will emerge. Since many of the biggest changes are yet to come, we will take you on a tour of the best resources currently available on our website. In an effort to keep visitors up to date on future events, our archaeology calendar has been updated. One upcoming event is the Society for Pennsylvania Archaeology’s annual meeting April 10-11, 2015 in Bethlehem, PA. Our Archaeology Publications page has also been updated; here you can find information on upcoming and recent publications, download our archaeology brochures, and more. You may have visited the Hall of Anthropology and Archaeology at the State Museum in Harrisburg, but have you ever considered the items that are not on display? Our exhibits represent only a fraction of our total collections. The collections summary page on our website has information on notable prehistoric and historic artifacts curated by the State Museum (there are over 6.5 million items in our collections). Researchers have utilized this incredible resource to produce magazine and journal articles as well as completing Master’s and doctorate degrees. Pennsylvania has a rich archaeological history, and educating the public about the past is a primary goal. The Section of Archaeology’s website contains a wealth of information, with a focus on Pennsylvania prehistory. Check out the Native American Archaeology section for overviews of each of the prehistoric periods in Pennsylvania’s archaeological record. These sections have been recently revised and updated to reflect our current understanding of Pennsylvania’s first peoples. Archaeology conducted during the Great Depression as part of the New Deal continues to play a role in our understanding of Native Americans in Pennsylvania. Our website hosts an entire section outlining excavations during this time in America’s history. These pages contain a wealth of information on excavations, artifacts, and current research as well as photographs of the men who conducted the excavations. From the arrival of the first Europeans to a rich military history to agriculture and industry; historic archaeology plays an important role in understanding Pennsylvania’s history. Visit our pages on early settlement, military, canal, agricultural, and industrial archaeology to learn more about historical archaeology in the Commonwealth. Ways for you to get involved with the State Museum’s Section of Archaeology will soon be organized into a series of pages aptly titled “Get Involved”. 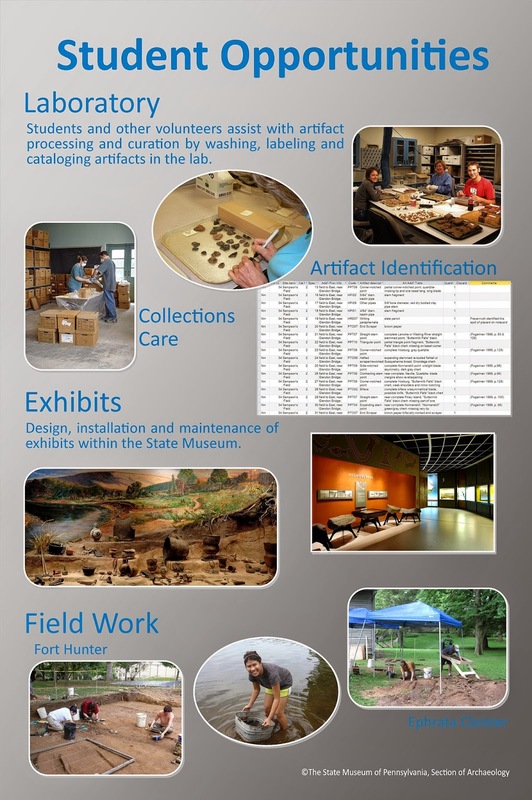 These pages will contain information on recording archaeological sites, avocational archaeology, as well as volunteer and internship opportunities with The State Museum of Pennsylvania. Professional resources, such as guidelines and policies, instructions for using the Cultural Resources Management Reports Database, and information on using our collections will continue to grow as our website is improved. Within our education pages, two school curriculums are available for teachers of grades four through eight. For additional educational, archaeological, and PHMC resources, visit our resource list. 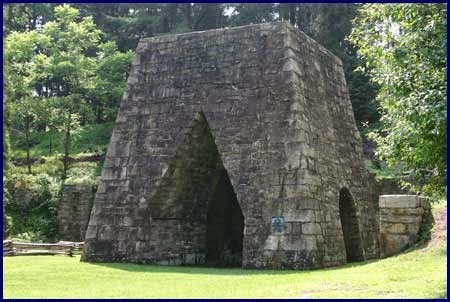 Pennsylvania’s history is our history, and the responsibility falls on us to educate the public about archaeology, and the Section of Archaeology’s website is one of the many ways in which we share these resources. People have been living in Pennsylvania for ~19,000 years. The written record of Pennsylvania, on the other hand, has only been available for a fraction of that time, less than 500 years. Were it not for the scientific excavation and recordation of more than 23,000 sites in Pennsylvania, we would know little about our earliest residents; how they lived or how their modes of survival evolved through time. As an example, we know that climate changes overtime and because we cannot control it we must adapt to it. Climate Change was the theme for our 2014 Workshops in Archaeology and our 2015 Farm Show Exhibit. By looking at the strategies that humans of the past adopted we are able to better prepare for our future. Among the many functions we, as archaeologists, serve in the Section of Archaeology at The State Museum of Pennsylvania is interpreting the importance and value of the extensive archaeological resources our commonwealth has to offer. 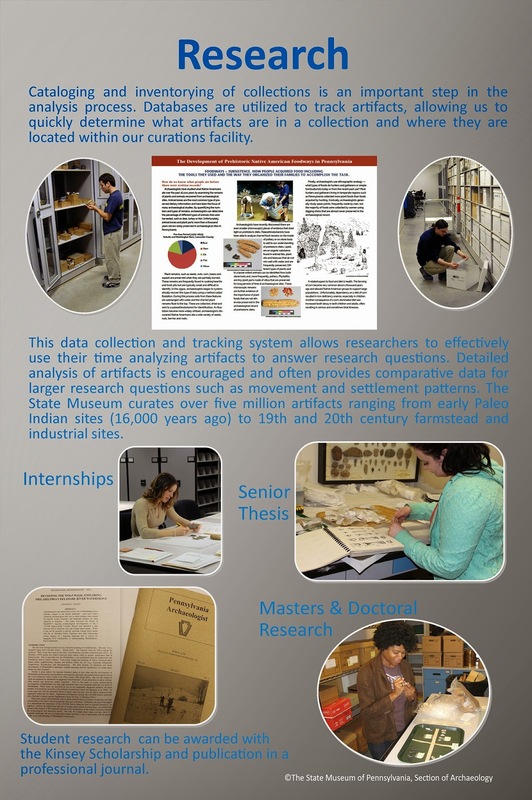 We do this through a variety of means: public outreach, field research, maintenance and updates to the anthropology and archaeology gallery at The State Museum, assisting researchers with the examination of our collections and using existing collections to investigate various research problems, as well as serving as the principal repository for collections obtained through Pennsylvania’s cultural resource management (CRM) projects. As such we are responsible for the care and curation of over six million artifacts representing the entire span of human occupation in Pennsylvania. We use all of these methods in an effort to demonstrate how archaeology teaches us about human endurance, resourcefulness and ingenuity. 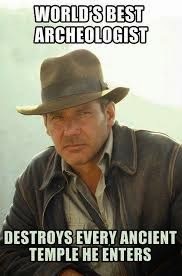 Unlike our cinematic icon, Indiana Jones “destroying every temple he enters” we realize that archaeological sites are non-renewable resources. This means that when they are destroyed by construction, neglect or for whatever reason, they are gone forever. The simple economic concept of supply and demand assigns value to things in short supply. 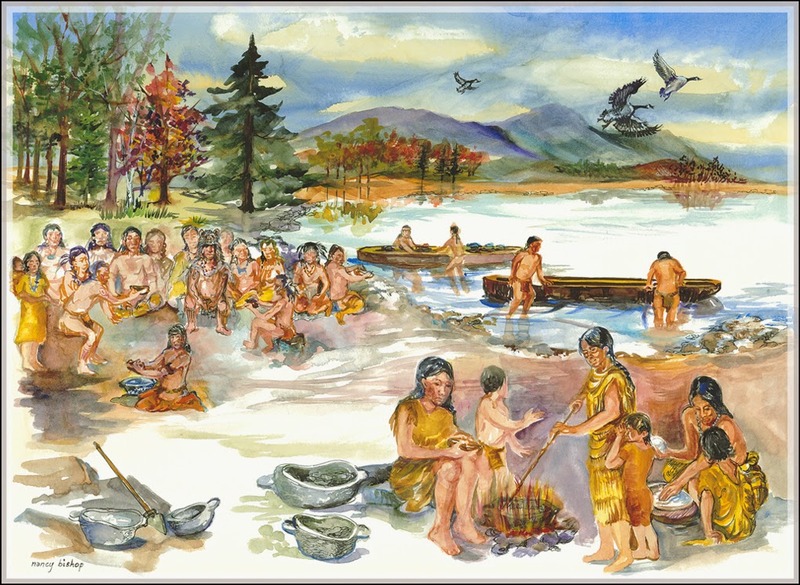 Therefore the limited nature of sites, the fact that there will not be any more Paleo-Indian sites or Susquehannock sites created means that every one of them is valuable due to its scarcity. Each has the potential to teach us something new that if the site is destroyed or unscrupulously excavated could be lost permanently. This simple post barely scratches the surface of the ways archaeology has enriched our lives but hopefully it leaves you intrigued enough to learn more. If you are interested in reading more about the value of archaeology please visit our website and peruse our past blogs. They contain a wealth of information about all aspects of archaeology and what we do here at The State Museum of Pennsylvania, Section of Archaeology.